Ashley, Eileen and activists in the town centre. 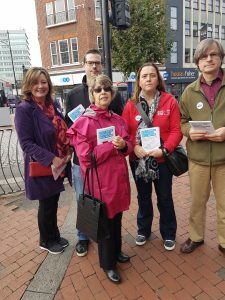 Ashley and Eileen were out speaking with the public in the town centre yesterday to raise awareness of the Tory Governments planned NHS cuts. Secretive Government plans that have had no public consultation could see up to £34m worth of cuts in Berkshire West which includes the Royal Berks. Plans could also see services merged together and some surgeries closed down. The secrecy of the plans was condemned by political and medical experts in Reading, who said the NHS should not have tried to hide the proposals. Reading Borough Council took a stand against the NHS by publishing their damning report, despite being asked not to do so. This entry was posted in Ward News on November 27, 2016 by Ashley Pearce.